Motorways are boring places: hours of tarmac, lorries and generic service stations that offer convenience but very little by way of variety or independence. Thankfully, the tedium of a long journey can easily be broken up by leaving at one junction and venturing into the English countryside until the next. A tactic I've found to be particularly useful when wanting to speedily skip a non-moving traffic jam. Now don't get annoyed, I'm not advocating using quite country roads as rat runs, but diverting to a nearby town for a break in an independent cafe is certainly easier on a driver's stress levels, especially when you're driving along the M4. Which is how I ended up in Hungerford one cold winter's day. Following signs from the High Street I easily found a car park and enjoyed my first experience of the market town's friendliness: a paid-for parking ticket waiting in the pay and display machine. I was so stunned by this uncharacteristic kindness that I found myself loitering until I saw a passer-by to check I'd not misinterpreted the printed ticket in my hands. This random act of kindness may only be a small gesture from one stranger to another, but it cheered me to encounter such kindness. Still cold, but with a bounce in my step, I wandered back to the main road and my destination: The Hungerford Bookshop. An understated shopfront with a large window invites visitors in to a well-lit room that immediately feels warm and welcoming. Taking stock of my surroundings, I navigated a selection of recommendations and non-fiction books in the front room of the shop, quietly enjoying the atmosphere of calm friendliness while the bookseller chatted to a customer. A narrow bookshop, space is cleverly used and it's surprisingly full without feeling overwhelming. Moving to the back I walked in a circle from children's to fiction and round again, before venturing downstairs to the secondhand section. So well-stocked it potentially deserves its own blog post, I only had time to properly concentrate on one area and returned to the fiction. A gorgeous wall of books, the fiction section is made snug by the proximity of the banister for the stairs, but what it lacks in space – a browser and I politely alternated shelves – it makes up for in variety. I soon found two or three titles I could've happily rehomed thanks to clever placings and introductory note cards. Then I turned around and a book chose me. The fiction recommendations are cleverly displayed in what would otherwise have been wasted space above the stairs, and while there may not be a lot of room for books, the whole 'table' was worth consideration during my visit. For me, it was a Pushkin Press title that jumped out at me. Having not long ago finished another of their books I was drawn to the publisher's name, then before I knew it I'd devoured the first chapter where I stood. 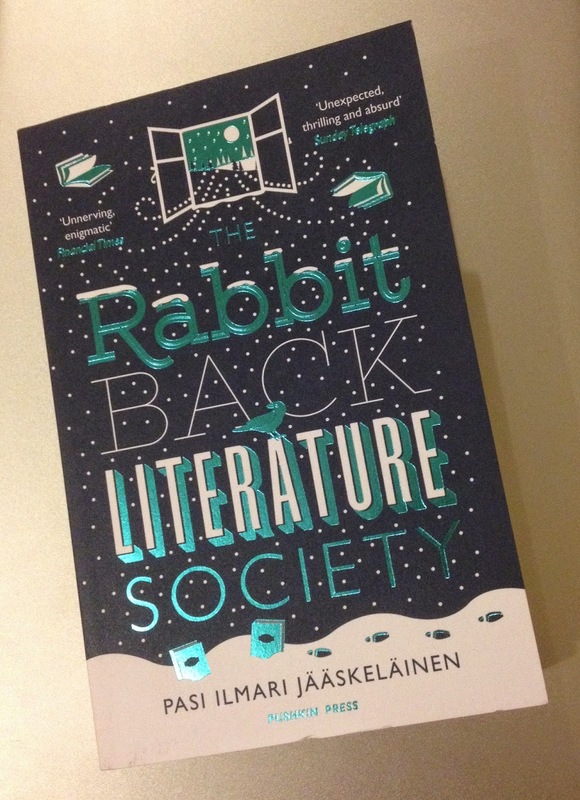 The Rabbit Back Literature Society by Pasi Ilmari Jaaskelainen had to join me on the road. Unfortunately I'd spent so long reading and relaxing that by the time I made my way to meet the bookseller he was already claimed by a crowd of customers. This prevented me from having a proper conversation, but didn't spoil my enjoyment of overheard bookshop banter. Such friendliness may have been overheard rather than experienced, but it was just the tonic I needed to be refreshed and ready to return to the motorway. Sounds like a great day! That's a really good idea, to veer off the motoway for a bit-and how lovely to be rewarded with such a gem. Will look it up when I'm next in the area. I certainly recommend the bookshop and the tactic, both have made me happy!